After enjoying a self-imposed break from blogging due to an inconsistent work schedule (and that good ol' time change we had) I am thrilled to be back to this blogging outlet I love. It's funny how time away from something can make the heart grow fonder. I didn't really realize how much time I dedicated towards blogging. But, having spent some time away gave me time to re-energize and re-boot, which is vastly important in the world of blogging. You never want to burn out on something you enjoy. While I was away from blogging, I nabbed this stripe tee from Gap during a recent sale. It has quickly become a favorite. The bold stripes make a statement without making me feel overwhelmed. It's literally been a throw-on tee that makes me feel put together. So my dear readers, what's been new with you? So good to see you back! I have thought about taking a break from blogging recently too. It always leaves you so refreshed! Absolutely know what you mean! 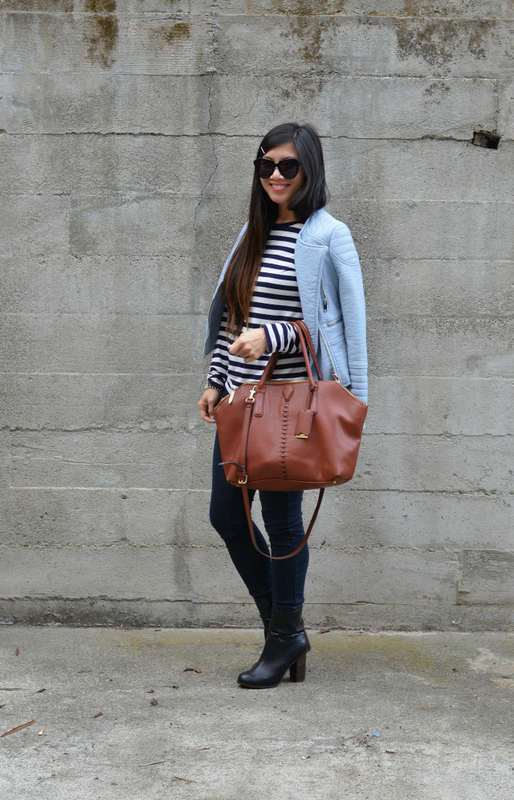 I had to pause blogging for awhile when I decided to go back to school and pursue fashion. I recently graduated at the Fashion Institute of Design and Merchandising in LA and also moved to England for my husband's work! So many changes and finally able to blog again. Re-booting is needed for us to re-charge and then go back strong! 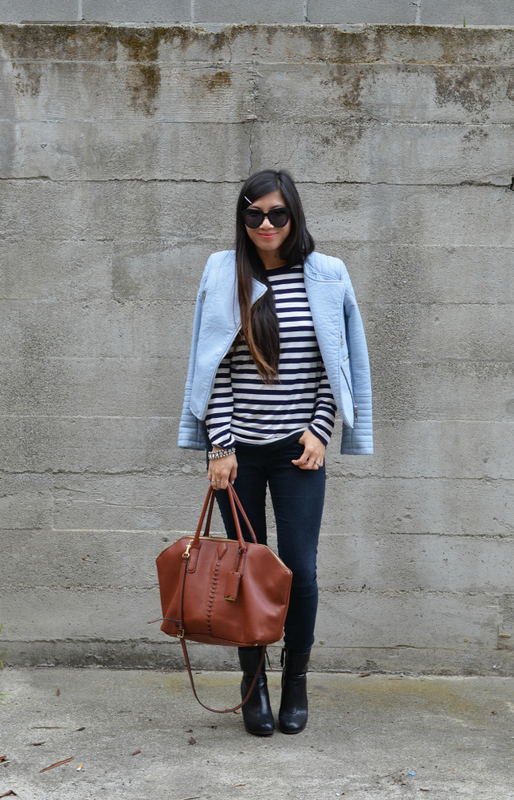 Love the stacked heel on that boot! LEt's see...I start a new job Thursday! I've always loved that shade of blue with black. You got a great tee. Welcome back! I'm taking a blog break this week. However, I'm still reading blogs. 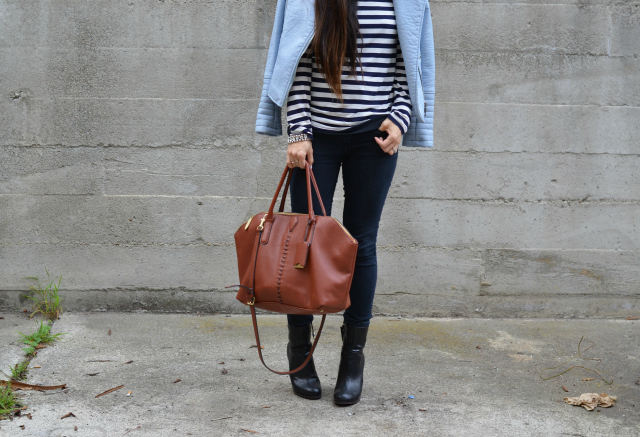 Love the striped tee and the bag. Glad to see you back. It's nice that you were able to refocus and feel re charged for blogging. I am a sucker for stripes and this tee will be such a great piece to have in your closet. 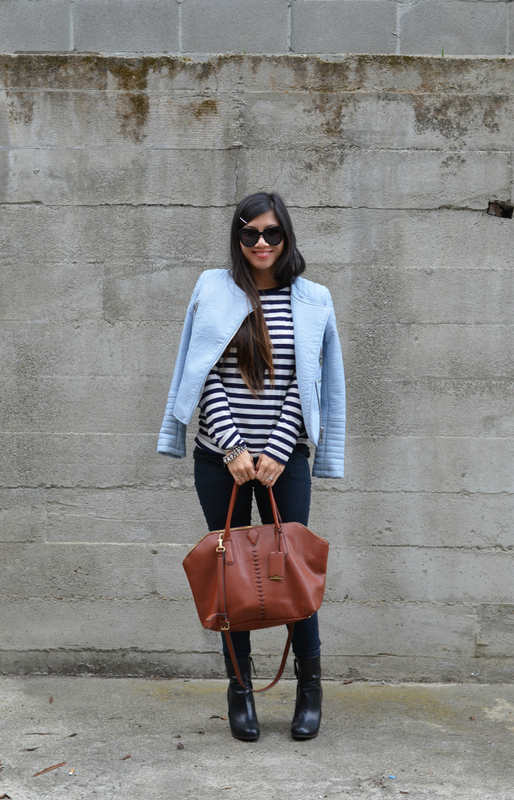 I love your blue jacket! I was thinking about your yesterday and realized how I haven't been on your blog. I thought it was another one of those glitches that my blog feeder had (sometimes it doesn't show updated posts from some blogs) but now I see you were on a blog break. Those are so important I think! So glad you feel recharged! I agree .. the time change has made it extra difficult to blog. You look great though .. I do love your jacket !! 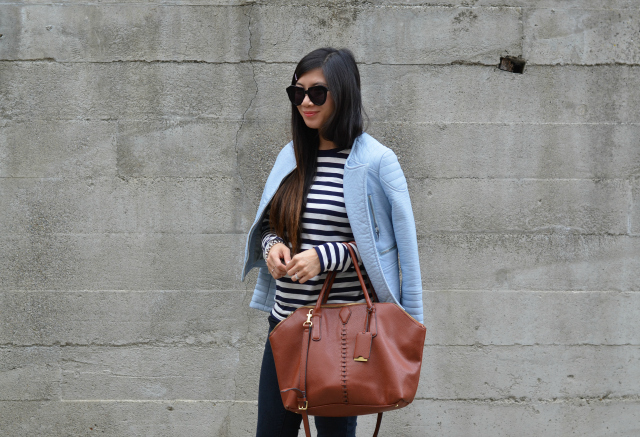 Cute and classic look!! 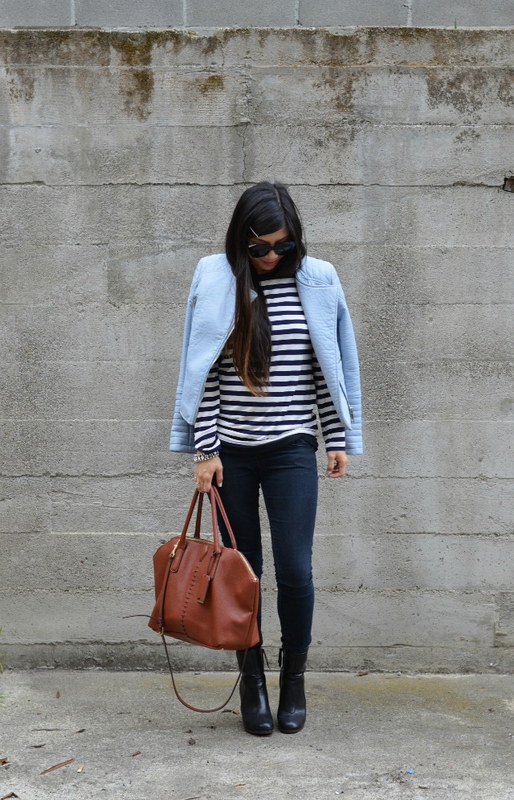 Love the blue jacket! I missed seeing your posts while you were away! Glad you're feeling refreshed! That jacket is gorgeous! Such a unique color too!